above the horizon, a soft and balmy wind. Our white wake stretched out for miles behind us, plainly marking our zig-zagging course, and the white water from bow to stern boiled silver in the moonlight. This is a big ship (at least to me). I should say that it was as large as a small cruiser. It is kept scrupulously clean. There is no formality, but the discipline is fine. The men are in dungarees, and the officers discarded their neckties and opened their shirts as soon as they came aboard. So did I. I already hate to think of leaving her, but as she may be out for a year I shall probably have to. My travel orders permit me to return at any time on any Navy ship or plane that can take me. Until after we got under way, I did not know where the ship was bound for; and the Skipper doesn't know where we may go form there. Anyway, it looks like a lot of excitement but not very much danger. It may be some time before we touch any place where I can mail this, so it will be plenty long before you get it. I shall probably add to it from time to time. Please let Jack and Jane read it. There is no use writing the same things over again to them. Then, when I write them, you can read their letters. 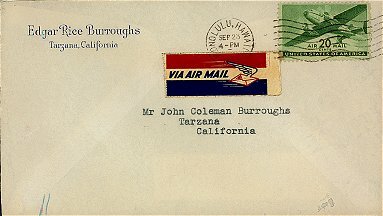 Shall post a letter to D at your address. I have no other and I owe two. 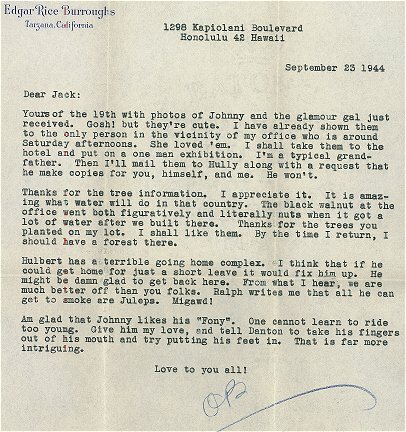 In the last one, it seemed that D would be back in California quite soon..
As you can read the letter that I wrote Jack yesterday, there is something more to add. 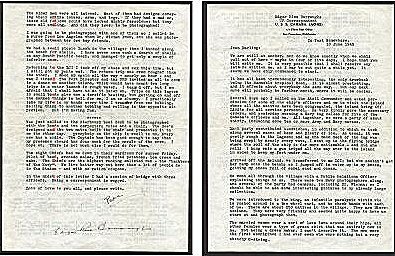 Your very welcome letter of September 4 came through in six days. I think this is the best time since the blitz. 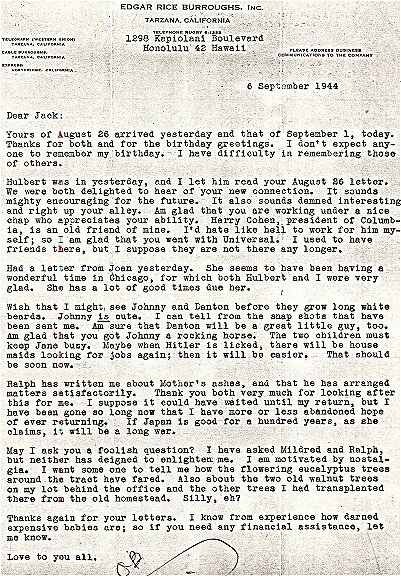 It was very welcome, as the last letters I received from Jack and Ralph were dated August 1. I know that you are all busy and haven't much time to write, but that in no way lessens our desire to hear from you. 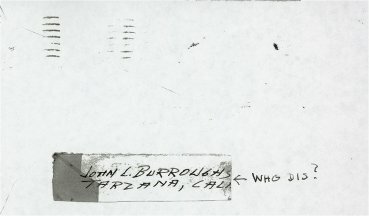 It would be nice if each of you would write Hulbert, so that he would find several letters awaiting him when he returns. I imagine that will be some time in October, although I am only guessing. He is a lucky boy to get this wonderful assignment. I wish that I might tell you something about it. Chuck said that it is so important that they had to send their best man. He said a lot of nice things about Hully - about his conscientiousness, ability, and intelligence. It was nice to hear this, coming form Chuck who knows more about Hully and his work than anyone else. But it didn't surprise me. Not only Chuck appreciates these things in Hully, but he tells me that both their immediate commanding office and the commanding general do, also. 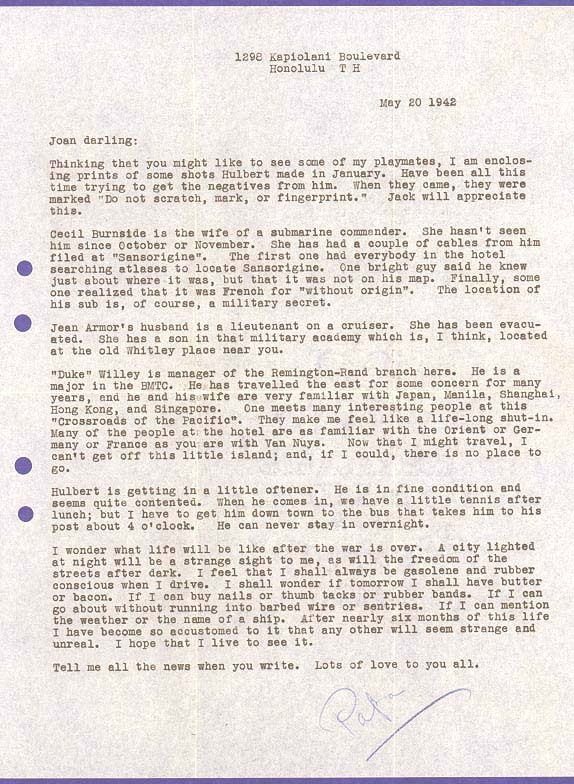 Fortunately for Hulbert, his assignments often throw him into immediate contact with the brass hats. And that helps. It was cute for Mike to buy Victory Stamps. I don't know where he gets that trait. Certainly not from the Burroughs side. I show his pictures, as well as Joanne's and yours, with great pride. Also Hulbert's, Jack's, and Jane's, having recently acquired a large album in which all the snap shots I have are mounted. Of course I never inflict it on my visitors. I just haul it out to show them a picture of themselves or some friend of theirs. It is not my fault if I have to explain that "This is my daughter and these are my grandchildren; and here is my other son and my daughter-in-law. My daughter used to be leading woman in a stock company and my son is an artist - he illustrates all my books, etc., etc." Of course I have to tell them what a lovely trained voice you have. Chuck asked to see them. I had a sweet letter from Joanne. She has probably received my reply by this time. I am delighted that she liked the little lei. I thought is was cute. You ask, how I am. About once a month I go to my doctor for a sort of check up. I went this morning. I have been suffering from insomnia. Can't seem to sleep more than eight to ten hours a night. Last night I slept only eleven hours, with the result that the diningroom was closed when I awoke. Had to go down town for breakfast. The doctor says he is afraid that I shall live, not being able to find anything wrong with me. I told him that I was worried because I felt so well. I have no business to feel so well at my age. I think he agreed with me. his sub is, of course, a military secret. at the old Whitley place near you. "Crossroads of the Pacific". They make me feel like a life-long shut-in. post about 4 o'clock. He can never stay in overnight. unreal. I hope that I live to see it. Tell me all the news when you write. Lots of love to you all. I had a good one of you, too. swim. He is looking fine. a swell dinner, he ran three training films for us. play with our regular foursome. in the way. Also, I sha'nt live forever. 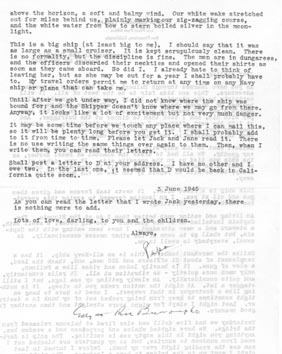 The following letters represent a sampling of the many letters that ERB sent home to son Jack and his wife, Jane, in WWII. 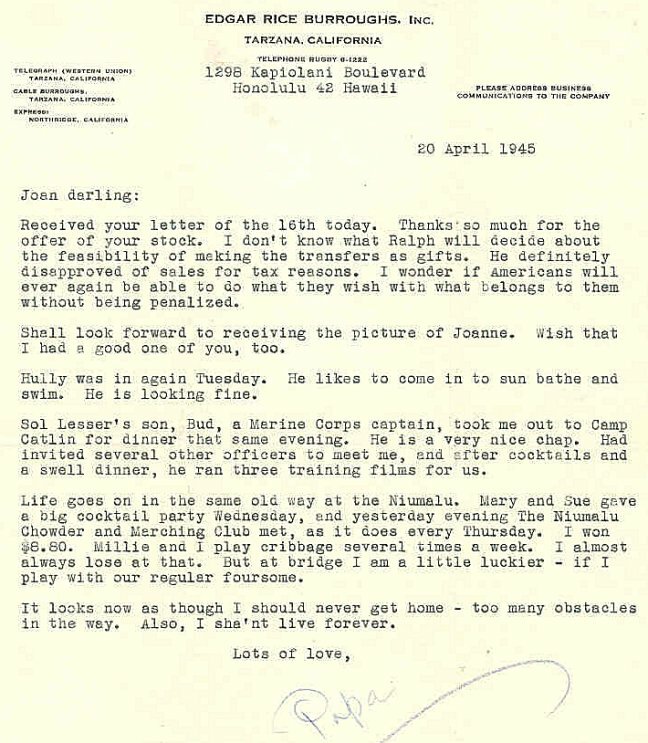 During the war years he served in Hawaii and the Pacific Theatre as the country's oldest war correspondent and he wrote hundreds of letters to family and friends back on the mainland. 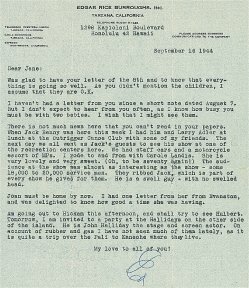 Many more of these letters have been featured over the years in our Lost Words of ERB series and Jane Ralston Burroughs Tribute pages Correspondence I section. Yours of August 26 arrived yesterday and that of September 1, today. Hulbert was in yesterday, and I let him read your August 26 letter. friends there, but I suppose they are not there any longer. glad. She has a lot of good times due here. been sent me. Am sure that Danton will be a great little guy, too. claims, it will be a long war. there from the old homestead. Silly, eh? he make copies for you, himself, and me. He won't. should have a forest there. get to smoke are Juleps. Migawd! 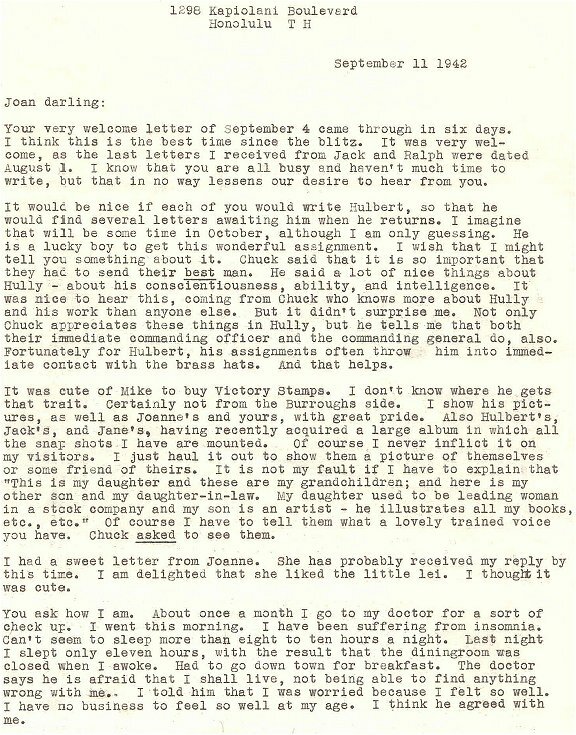 Another Sample of the ERB Correspondence from the Jane Ralston Burroughs Tribute Site: Correspondence II. assume that they are O.K. I haven't had a letter from you since a short note dated August 7.
must be with two babies. I wish that I might see them. There is not much news here that you can't read in your papers. and was delighted to know how good a time she was having. Am going out to Hickam this afternoon, and shall try to see Hulbert. is quite a trip over the Pali to Kaneohe where they live. My love to all of you!